And in turn lay the foundation for agile marketing and with it, utilising these same values to underpin how to deliver a successful agile marketing delivery function. A digital tactic that has helped propel the practise of agile marketing and thrust it into the limelight is the growth in Social Media and the rising demand of users expecting real-time content and information served to them by their social channel of choice, something which publishers, retailers and Government, championed by the Government Digital Service (GDS) time and time again that an agile approach is a winning strategy as this blog post demonstrates. There are a number of established ‘bricks and mortar’ sports retailers who have opted for a price-led strategy for their product range in a race to the bottom. 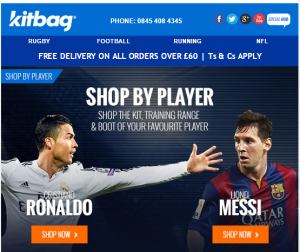 Rather than compete on price, Kitbag saw an opportunity to shift its focus by maximising the opportunity to provide official name and numbering of the latest players being transferred to different football clubs. A majority of football shirt sales are due to well known global footballers being transferred to a football club and in turn demand for sales increase with the players name and number. To support this real time strategy, Kitbag removed their organisational silos and created a cross office team bringing together their digital, warehouse, stock control and pricing and formed a team that monitored and listened for the latest transfer news from SkySports, Twitter and official club websites of the latest transfers and in turn created official name and number shirts promoted through the brands digital channels. 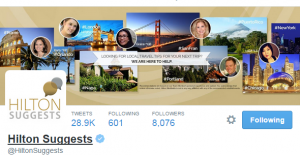 Hotel company Hilton Worldwide operates a program on Twitter under the handle, @HiltonSuggests – providing helpful advice to their followers on relevant information about their portfolio of hotels across cities, towns and regions. For a lot of brands, interacting with their followers or even jumping on social media comments would “strictly” be allowed only if such comments were about their brand. Not for Hilton. By monitoring comments and advice based on locations it created an opportunity to generate interactions and conversations with the general public, irrespective if they were a Hilton customer. @HiltonSuggests saw a unique opportunity to interact with anyone who is looking for information based on location. Their social media strategy is offering advice, comments and assistance to anyone posting a tweet and is looking for general advice. Their logic is that some day that individual may be seeking a hotel room and will remember how @HiltonSuggests were so helpful. The ability to adapt and change your product/service to the demands of your audience in real time through digital communication is becoming the battle-ground we are moving towards whatever your organisation and understanding your audience as well as your point of differentiation has become a necessity, something an agile marketing approach can assist ability to react and commnicate your product or service. Here are 7 takeaways to help you begin to define an agile approach to your organisation. Traditional sectors are having their rule books re-written due to the digital revolution and with it the need for technology moving out of an organisational silo and aligning itself within marketing depts. Large and mid-size organisations are realising that the fastest way to help their teams become more like a start-up in terms of its route to market and the organisational culture in embracing existing and new digital channels to market their products and service to different audiences. As with working in a start-up organisation, you simply can’t stand still. You have to keep on pushing yourself and the company in not being afraid to try something different, putting something out there in the market. If you fail, you fail, dust yourself off and get back on it again. Learn to promote and communicate your successes with your organisation through an agile marketing strategy. The more you manage to get buy-in from across the organisation, the more support you’ll benefit from when having to utilise different resources and personnel for support. Creating a point of difference within your market helps to drive a personality for your brand, what you stand for and how to communicate this within your agile delivery. Creating a USP provides the opportunity for your brand to define a differential advantage over your competitor’s products, services and their brand positioning. “Keep your enemies close…” – It’s important to understand who you’re up against. Who are your main competitors? what are they offering? To support your agile approach, here are 3 key points to consider when setting out your competitor analysis. Listen to your market– It’s important to understand how your competitors are operating in the market – are they reacting to market changes, new products and promotions, are they interacting with their audience and customers via social channels? What’s their reputation like through social and digital platforms? Who’s setting the benchmark?– Staying on the theme of Social, create a SWOT analysis on your competitor social media performance analysing their key metrics (followers, likes, retweets, shared content), what’s the size of their social media following and are their certain channels they’re investing in more than others? Are they spending money on paid social interactions (e.g. Promoted Tweets) to drive their strategy or campaigns? Exploit Gaps/Opportunities– Defining a Gaps and Opportunity analysis can be very effective if you’re operating in a crowded market place and are looking for a way to stand out and differentiate. The end of the Industrial Revolution and how many organisations (and their cultures) operated is in a steep decline. In its place is the connected economy which has provided the stimulus for start-ups and new business models re-write the rule book for these traditional sectors and with it have embraced new models and approaches taking the initiative to tear down what were “barriers to enter markets” and the destruction of monopolies. 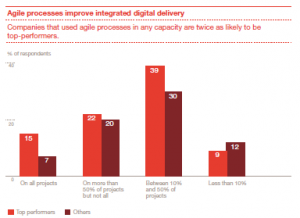 A recent report by Accenture summarised the point that in the digital world, functional silos – no matter how efficient or leading edge no longer work and due to this organisations leading the digital transformation are putting their IT and marketing agendas at the top of their agendas. Ensure you have created dashboards from your analytics to help steer an agile approach, based on your core objectives, that provides insights and opportunities to empower your team and to justify to senior management the opportunities working in an agile way can offer new opportunities. The metrics being monitored should be actionable and should help steer regular catch-ups with your team to help define and improve performance. This entry was posted in Digital Strategy. Bookmark the permalink.